Girls camo backpack. For the girl who leans toward the outdoors. A small camouflage backpack in a canvas fabric with a oak leaf pattern. Just the right size for trips to the park, campground or girl scout outing. 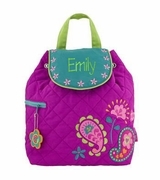 Girls camouflage backpack measures 12H x 10"W x 5" across bottom. 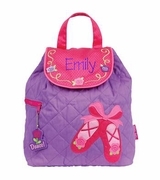 Lined with inside zip pocket, backpack carry straps and zipper closure.